It used to be the word ‘pulled’ only appeared in my lexicon in reference to a muscle – of the strained variety, following lots of ill-advised physical activity. Mention it now and I instantly think of pork; lush strands of juicy meat atop a soft brioche bun laden with tangy, crunchy coleslaw. But pork is not the only meat suitable for this treatment. Lamb works terribly well, tougher cuts of beef do nicely, and so too does chicken. They key to getting good ‘pulled’ anything, is low and slow. This makes pork, beef or lamb a tricky choice for easy midweek suppers. But chicken, even cooked low and slow, is ready in no time at all. Breast is not always best, it’s important to use the richer cuts of either chicken thigh or leg for this recipe. 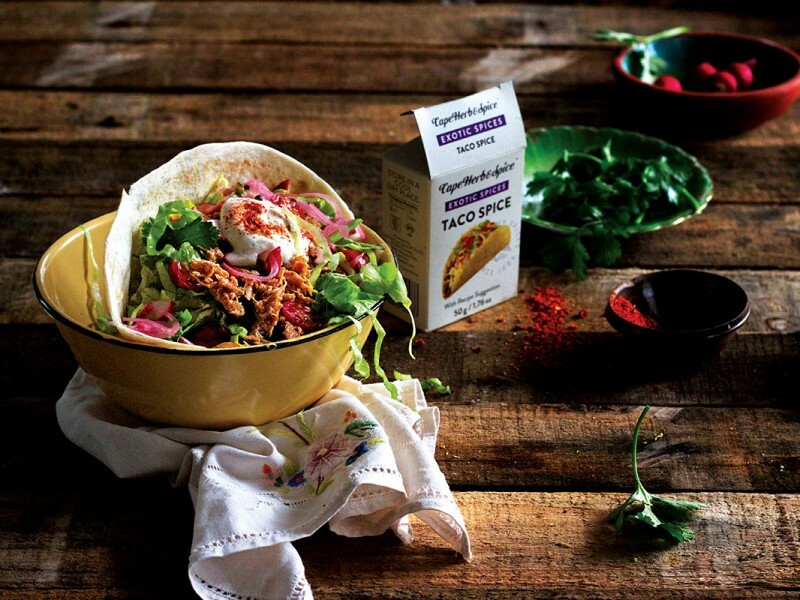 With Cape Herb & Spice’s Taco Spice mix added, it’s simply brilliant in a wrap along with loads of crunchy veggies. I use lard in this recipe, it lends a wonderful belly-pleasing richness to the meat, but you can easily substitute it with any cooking oil of your choice. Heat lard or oil in a thick-based saucepan and fry thighs until nicely browned all over. Remove chicken. Add onion and stir fry for 5 minutes until it starts to soften and caramelize. Add garlic and Cape Herb and Spice Taco Exotic Spice mix and fry for a further minute. Add chicken and water. Turn heat to the lowest setting and cook with the lid on until the chicken falls off the bone. Remove the chicken and pull the flesh apart using two forks. Place meat back in the pan, turn the heat up and cook with the lid off until all the water has evaporated. Stir in the yoghurt. Taste for salt and adjust if needed. Assemble the wrap of your dreams, top with a dollop of yoghurt and give it an extra dusting of the Cape Herb & Spice Taco Exotic Spice mix. Tuck in! Health-nuts stand by...this one is right up your alley!